It is that time of the year when all eyes are focused on the Sabarimala Sree Ayyappa Temple. 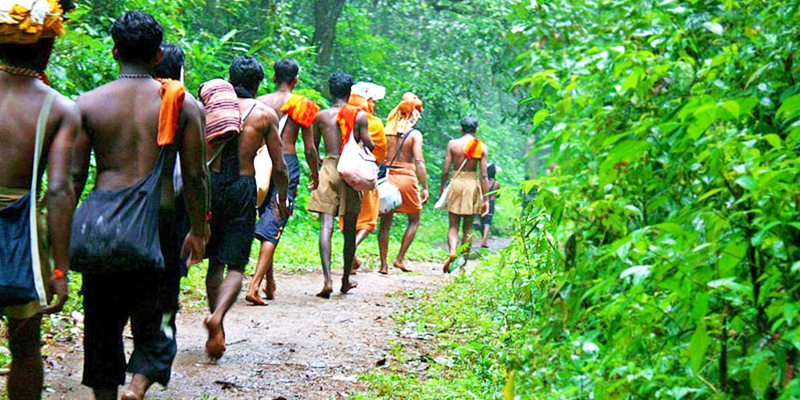 Pilgrims have already started making their way to Kerala in hopes of earning the blessings of Lord Ayyappa. In the next three months, a deluge of people are anticipated to visit this holy shrine. Though Makara Vilakku (on January 14, 2018) is the main draw at this temple, but presently devotees are rushing to the Sree Ayyappa Temple to pay their reverence during Mandala Pooja Mahotsavam (from November 11-December 26, 2017). In the coming months Sabarimala will see one of the largest conglomeration of devotees, who defy the hardships in favour of their faith. The temple of Lord Ayyappan gets its mention as early as 12th century, when the Prince of Pandalam dynasty known as Manikandan, mediated at the ancient temple. It is believed that on the holy day of Makaravilakku, Lord Rama and his brother Lakhsmana met Sabari, a tribal Goddess and were blessed by her. It is also the day, when it is believed that Lord Dharmashasta stops his meditation to bless all the devotees visiting the temple. With the hopes of getting divine blessings, millions of devotees make their way towards the temple. 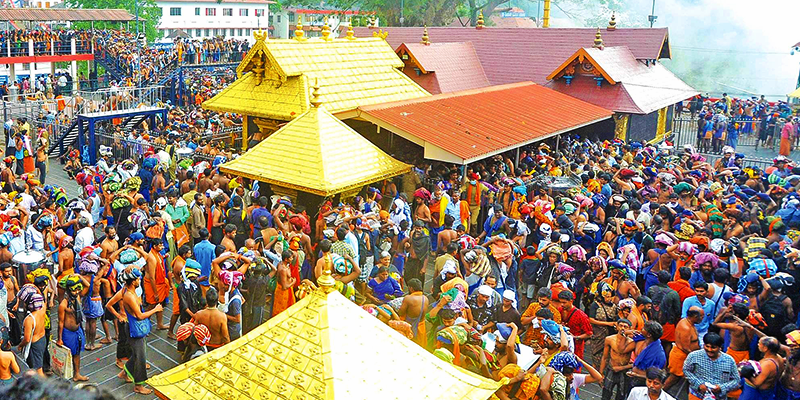 Sabarimala is one of the most difficult pilgrimages. It takes a prior preparation, and not just anyone can take this walk of faith. To undertake such a pilgrimage the devotee needs to be both physically and mentally fit. So, how do prospective pilgrims prepare? Preparations start with a 41 day Vratham (fasting). This Vratham should usually begin on the first day of Vrischikam (according to Malayalam calendar) in mid November. During the Vratham, one cannot attend any social activity and spend time praying or singing bhajans. This should also be accompanied with visiting the temples, cleaning them, feeding and helping the poor or sick people. He must sleep on the floor, use a wooden block for a pillow and walk bare feet. He must also not oil his body or his hair and must always carry a tulsi leaf with him to keep away evil thoughts. During the days of Vratham, devotees must eat only pure vegetarian food and abstain from physical or verbal violence, alcohol and tobacco and intoxicants in any form. 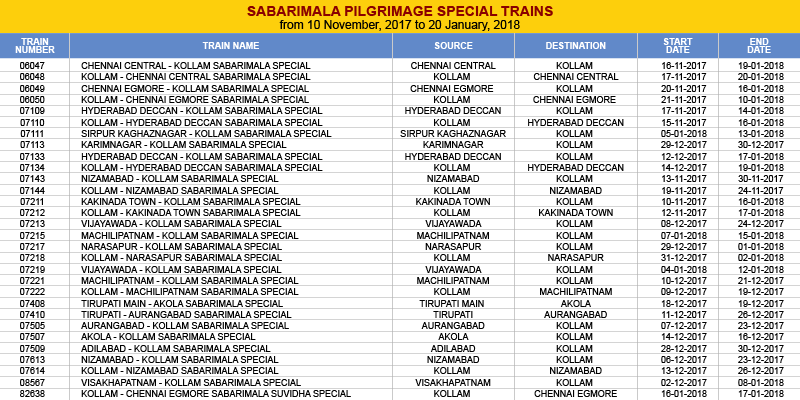 If you are travelling to Sabarimala by train you can order exclusive Sabrimala fast (vrat) food through the RailYatri app. RailYatri has been offering Satvik food for group travelers to Sabrimala food for the last 4 years. 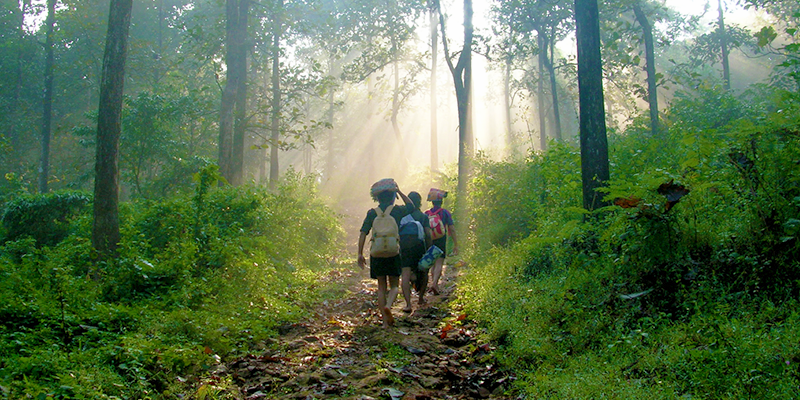 Seeking divine blessings from Lord Ayyapan, devotees trek through the mountanious forest paths. All the devotees have to walk across atleast 8 KM on the steep mountainous tracks. Though the route has been re-developed in the present times and along the road there are provisions for medical aid and other emergency support available, but it still remains an arduous trek, no doubt. This trek pushes the physical fitness limits of all the devotees. Helpline Numbers: Southern railways has set up toll free helpline numbers. For security issues dial 182 and for other service related enquiries dial 138. Both the numbers will be handled by staff having multi-lingual capabilities. Special Buses: KSRTC will operate 10% more buses this year, than the last years. Other Facilities: Police and medical booths will be set up along the road to the temple to make sure that pilgrims face no problems. Men’s only pilgrimage: In 1991, Kerala High Court legally restricted the entry of women in the menstrual age group into the temple. The pilgrimage is, till date, meant only for the men. Though, the Supreme Court of India is currently reviewing this rule. Dress Code: Pilgrims to Sabarimala can be easily identified through the colour of their clothing. They have to wear black or blue dress. Apart from this they will be seen smearing sandalwood paste and Vibhuti on their forehead while undertaking the pilgrimage. Neyyabhishekam: It is one of the important rituals that the devotees undertake after reaching the temple . 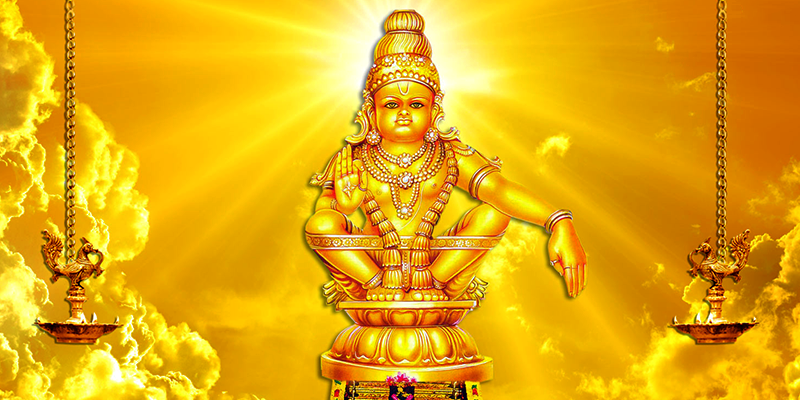 As a part of this ritual, ghee brought by pilgrims in their Pallikettu or Irumudi is poured on idol of Lord Ayyappa. Bags Matter: Pallikettu or Irumudi is a two compartment bag made of handwoven cotton and used to carry the offerings to the temple. There is a particular colour code for these bags as well. If a pilgrim carries a red coloured bag it signifies the first journey to Sabarimala, while navy blue bags are used till third visits and saffron coloured bags thereafter. Prasadam (holy food): Once the pilgrims complete their journey and all the rituals within the temple, they can have a delicious Prasadam that consists of Aravana Payasam (made with rice, sugar and jaggery) and Appam (pancake made with fermented rice batter and coconut milk). The Lullaby: If the devotees stay on late, they can enjoy the Harivarasanam song which is sung just before closing the temple doors. This lullaby (Urakkupattu) was composed by Sri Kambangudi Kulathur Srinivasa Iyer and has 108 words in 32 lines. 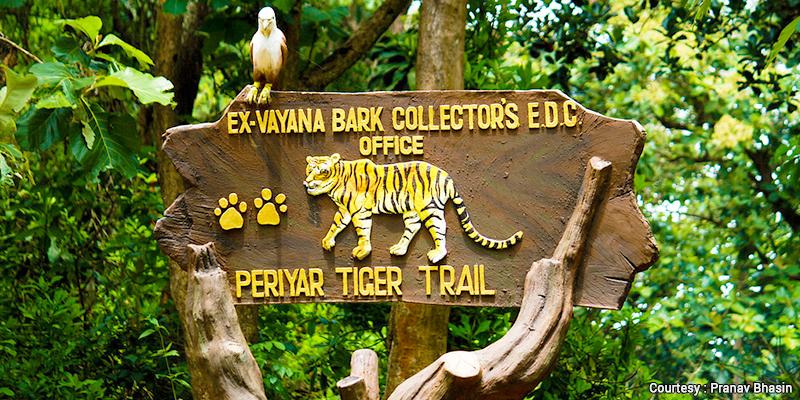 Periyar National Park: Situated in Thekkady town, this Tiger and Elephant reserve is a great place to spend some time in the lap of nature. Known for its scenic beauty and amazing bio-diversity, this is a must visit destination when you are in Sabarimala. The reserve is filled with colorful varieties of orchids and other flowering plants. 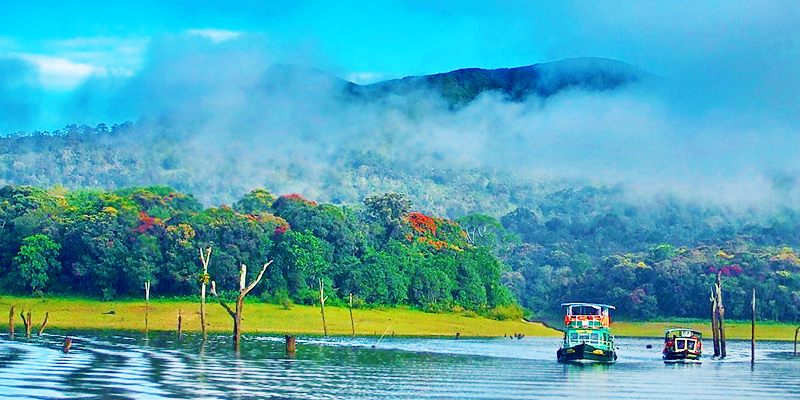 Periyar Lake: This pristine lake is situated within the Tiger Reserve itself and is dotted with many scenic attractions. The rich flora and fauna around the lake will leave you mesmerized. Boating is a major attraction while at the lake. Pics are amazing. Thnks for sharing.. Interesting article you shared about Sabarimala. Surely everyone will read this type of article about Sabarimala in this season. Really informative. Expecting more articles like this. Keep writing. Thanks a lot, Keep reading such blogs on http://www.railyatri.in . I am actually keen on reading this website’s post regularly. They carry good information.